So it is perhaps no surprise that the industry has turned its attention to the enterprise segment, one which has less price-sensitive customers with higher demands for coverage, capacity and sophisticated mobile services. Enterprise small cells are much more in evidence, such as ip.access' nanoCell, which can be deployed in conjunction with Distributed Antenna Systems (DAS) in enterprise environments, and many vendors now focus on how to position small cells to penetrate this high-value segment. This is the new hot segment, opening up a rich service portfolio to offer to enterprise customers, a market that has been a tough nut to crack for mobile operators. Combining enterprise small cells with network-based management applications potentially enables operators to add significant value to this segment by bringing new mobile services and features. These could include dedicated voice capacity, mobile unified communications, mobile call recording, local switching of voice traffic and context aware services, as well as the fast-developing field of network analytics. 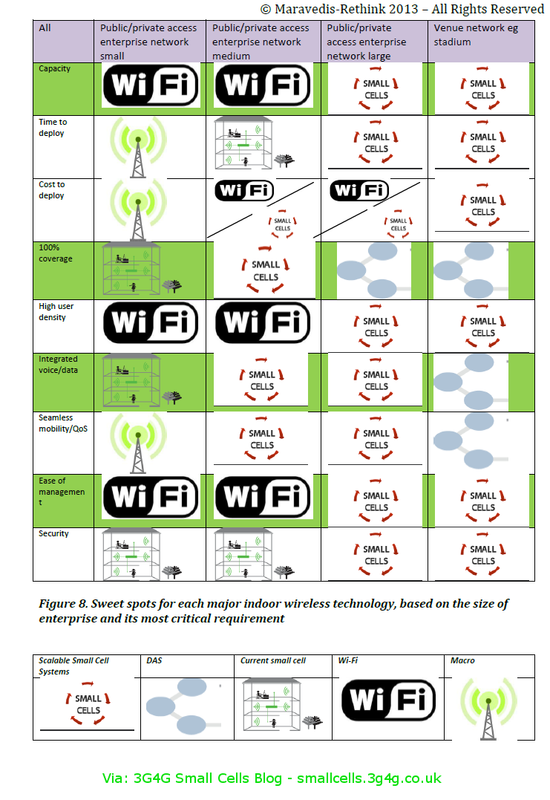 However, there are also several key enterprise challenges that are significantly more complex than those found when offering femtocell services to consumers, such as managing inter-cell interactions, delivering consistent coverage over larger areas than a home or SOHO, as well as typically needing to support increased user numbers with higher user mobility. All of which means that as small cells become part of mobile operator strategies, there is a rising need for common guidelines and best practice, for products and deployment and Release Two provides an "all you need to know" guide to help operators deploy enterprise small cells. This follows on from Release One, a similar exercise centered on consumer femtocells, unveiled in February at Mobile World Congress. Release Three focuses on urban small cells and is scheduled for release at Mobile World Congress 2014. However, to date the enterprise has largely proven hard to target effectively. Traditionally this market segment has been underserved, as options such as DAS have only been available to larger scale enterprises due to the considerable costs involved. There are specific challenges of using DAS, which require a room in which to deploy a macro/pico BTS, and then the installation of industrial-grade coax to pipe the signal around the building, and sometimes requires an upgrade to the building's power. This is often invasive, expensive and time-consuming.